With the emergence of the digital era, the internet has become an indispensable part of a major population’s daily routine. With this, functional and responsive websites have become an indispensable part of any business’s growth perspective.The importance of website speed optimization can be summed up in three words: Visibility, usability, and conversions. The more optimized your website will be, the more will it be visible. Most of people would search for a business or a company on the internet. They would build an image of the business by looking at its online presence and analyzing its website. Therefore, if your website is not responsive, functional or optimized, it can put your business in trouble or in a disguised loss. Websites have become an integral part of any company and so, many businesses are already paying close attention at maintaining optimized and creative websites. Make sure that you don’t lag behind! Also, an optimized website with the desired speed and page loading time will make it easier to use for anyone which can ultimately lead to an increased rate of conversions. Most of the time, the problem can lie with the host of the website. The three main types of hosting namely are Shared hosting, virtual private servers (VPS) hosting and dedicated server. Among these three, shared hosting, being the cheapest one is most common however it is not the fastest one. VPN and dedicated server hosting are much faster. Therefore, if you’re facing some serious issue in your website speed and are using the shared hosting, you may try changing the hosting type and see if the results are desirable. Server less architecture is also recommended in fixing this issue. Broken links are one of the prime reasons for the bounce rate of your website. This can make the users leave your website soon and hence prove to be unrewarding. The best thing to do if you face an increased bounce rate on your website is to check the broken links and fix them. Remember, less is more? Well, this is the rule that applies to the plugins on your website as well. Reduce the number of plugins in your website and watch out for results. Additional website functionality with plugins can in a way add more tools and functions to your site but it will cost the degradation in performance. Adding a number of plugins in order to add a number of unnecessary functions and tools is totally a waste. What’s the use of adding around ten plugins for just social media integration? It can, of course, reduce the coding efforts but it’s really fatal for performance and speed of your websites. However, if the installed plugins are well developed to avoid the complexity in the website, you can take the risk! Page loading time largely depends on the overall content size on a web page or website. Therefore, a heavy file or image would take a lot more time to download and hence will hamper the speed of the website. Optimized images which run in line with the website speed optimization can work well in improving the website performance and hence decreasing the bounce rate of the website. Make it a rule, cache your website often in order to optimize the speed. Servers work slowly when there are a lot of users accessing the website simultaneously. Caching stores the current version of the website on the hosting and presents this version until the update. So, the web page doesn’t render over and over again for every user. Hence, Cached Web pages turn out to reduce the web page loading time and increasing the website speed. Web fonts have greatly impacted the website designing. However, though being highly desirable in website designing, they are highly undesirable in a speed-optimized site. The web fonts tend to increase the page loading time of the website. To reduce the size of web fonts traffic, there are several ways which prove to be successful. Three most important one of them include using the modern formats for modern browsers, including only those character of sets which are used on the site and choosing the styles which are needed characteristics. Website speed can greatly impact your business, conversion rate and ultimately sales and so, it is not something you can ignore. 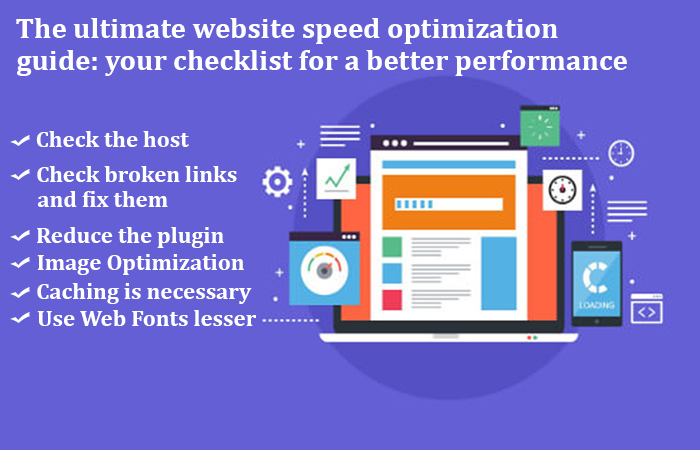 With the above-listed tips and more, you can easily optimize the speed of your website. The results are visible and desirable. Just like any other thing, an organized and clutter free website would function more speedily and perform better. Therefore organize, clear and fix! For more tips and tricks to step-up your digital marketing campaign, visit http://www.readcolors.com/blog/. We are the fastest growing and an emerging leader in the digital marketing services in Gurgaon and work at optimizing the dynamic approach for business growth!